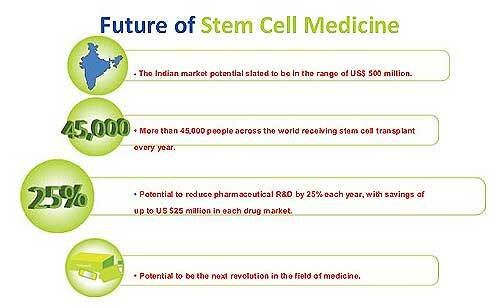 Widely accepted as the future of medical technology, the Indian market potential for stem cell treatment is slated to be in the range of US$ 500 million. Stem cell treatment has been widely accepted as the future of medical technology, therapy and any kind of treatment for health hazards. Research so far has proved that stem cells have the capability to treat human diseases therapeutically. However, researchers are still in their early stages and trials are being conducted on an ongoing basis. Some of the trials have proven effective in certain areas, but these results are not sufficient enough to ascertain the absolute efficacy of treatment. However, safety of autologous stem cells (Cells taken from the patients’ body) has been established through various trials across the globe. Unfortunately, there are a lot of establishments now-a-days, which are offering these treatments to patients, without any proven protocols or safety measures. Treatments are being sold as a magic treatment that can cure any disease with guarantee. Often patients who have no conventional treatment left fell prey to such establishments and loose large amount of money without getting proper therapy, and therefore, no results. To refrain from such fraudulent practices, patients must understand their present health condition and pattern of the disease because the use of stem cells rests on their ability to differentiate into an enormous range of healthy functioning adult cells. Thereby, providing a replacement source of cells to treat any serious diseases. It is important for the patient to answer the basic questions of whether I am a candidate for stem cell therapy, (2) What kind of cells do I need? (3) What are the sources of cells? (4) What is the quantity of cells I need? (5) What is the method of re-injection of these cells? There needs to be a proper logical protocol set for answering these questions and patients must look for genuine establishment that are able to answer these questions backed by research. It is true that you carry your repair kit with yourself naturally. i.e. your stem cells. However, stem cell therapies spark skepticism because the range of diseases for which there are proven uses for stem cells is pretty limited. As a consumer, it is necessary to discuss the issue with a health specialist on all the available conventional treatment modalities before trying something as experimental as stem cells. During the consultation, one must consider the basic criterions starting with the most suitable type of stem cell transplant, beginning with the right form of transplants and their source. An Autologous transplant is used to treat some types of blood cancer. In fact, it is a standard treatment for patients with multiple myeloma and can make the myeloma go away for a time period. In this therapy, the patient’s own stem cells are removed from his or her bone marrow or peripheral blood before the transplant. Allogeneic stem transplant is another form wherein the stem cells are donated to the person from a genetically matched stem cell donor. Although this form of transplant offers the best chance of curing a number of blood cancers and other serious diseases, it is much riskier than autologous transplants. Cell administration route, procedure and timings are the other criteria to be considered before opting for the transplantation because the closer the cells are delivered to the target area, the more effective it will be for the patients. Observing the everyday advancements in stem cell technology from the research and clinical perspective, stem cells do promise a healthy future for the coming generations in India. However, the patients must understand that stem cell transplants turn out to be successful in 50-60 per cent cases and that too just in improving the condition of the patient. Before approaching any therapy provider, patients must do a thorough research on their credentials and whether a disease-specific specialist is going to perform / supervise therapy or not. There should be a team of doctors performing a procedure and not just one person doing it all. Since the lab processing the cells is of a major importance, it is advisable that the patient should visit the lab where the cells are being processed and the hospital where the procedure is to be performed. If possible, visit the lab to check its sterility and insist on meeting the scientists who will process the cells. What comes as the biggest worry is the lack of proper regulatory framework and ethical norms when it comes to governing stem cell usage. At present, only guidelines are doing the rounds, which have resulted in the escalation of many clinics, hospitals, and nursing homes, claiming successful treatment by stem cell therapy. Blame it all on the lack of awareness on stem cells and its treatment. Patients are supposed to be aware of unregulated treatments and check whether the treatment providers are following the guidelines, prepared jointly by the Department of Biotechnology (DBT) and the Indian Council of Medical Research (ICMR). Besides, they must keep on asking questions, do research, and read articles to clarify any doubts and misgivings. But once the choice is made and the investigation turns favorable, one must have complete faith in the treatment providers. Deciding the right place for stem cell transplant can be a tough decision but it all depends on making up your mind to have a transplant as it is an exciting, new treatment, and new benefits of using stem cells are discovered on a regular basis. It’s imperative that you are as informed as possible while making a decision about it and know how to ask the right questions to ensure the right treatment and results you’re looking for.